120-degree desktops are perfect for flexible offices and can be arranged into groups of three or more with a variety of configurations. We recommend measuring your office to help determine an ideal desktop size. 60" and 72" widths are the most popular. Tame and route your cables around your workstation with this Magnetic Cable Organizing Channel, which sticks to your desk frame in a snap! Choose a frame color that complements your desktop style and office decor. You may later pick accessories that match your frame color. Our Switch and Large Keyboard Trays are solid, easily adjustable, and let you type with your keyboard tray in your lap to lessen shoulder strain. As your height adjustable desk moves up and down, your wires go with it. Power grommets provide convenient outlets right on the desktop. Acoustic panels significantly reduce noise in an open office environment and improve privacy at your desk, helping you stay focused! Modesty panels hide the view under your desk and are an ideal wire management solution. They're a perfect mix of privacy and organization! Make your desk mobile with locking standard or heavy duty casters. You'll be organizing and optimizing your office layout in no time! We recommend alternating between sitting and standing every few hours. Our ergonomic chairs are approved by our Certified Professional Ergonomist. We recommend placing your computer on the desktop or in a CPU holder to avoid pulling cables and for easy access to ports and peripherals. Standing desks are made to help you move! Choose our active mat to stand comfortably, stretch, and shift positions throughout the day. Adding this Bluetooth dongle will allow you to adjust your desk, customize a health plan, and keep track of your progress, all from your phone! Clear your mind with a clutter-free desktop. Keep office supplies organized or personal items locked away with an under-desk drawer. If you'd like to get your order even quicker, we advise selecting our expedited production option. Footrests can help vary your posture and improve circulation, and they help users under 5' 4" keep their feet grounded when using an ergonomic chair. We recommend the advanced keypad for its one-touch convenience and memory settings. Sit or stand with the push of a button! The right lighting can help improve your productivity and work quality. From desk lights to floor lamps, we have you covered. Monitor arms position your monitors at the perfect height and distance to help prevent neck strain. They also free up valuable desktop space! Really get moving! Balance, stand, and rock your way to better health while you work with a motion board underfoot. Keep power within reach on your desk with two attachable power options: Clamp-on Surge Protector with USB Charger and Clamp-on Power with USB. Free! Add a combo of accessories on us, including a standing mat, which will help you stand comfortably at your new desk. Free! Add a combo of accessories on us, including a standing mat or motion board, which will help you stand more comfortably at your new desk. Get another accessory on us! Pick a bamboo or colorful desk organizer set, or choose a USB hub to attach additional peripherals. For a limited time, snag a few more accessories to outfit your new desk or give as a gift - completely free, of course! Noisy neighbors? Turn down the volume while giving yourself additional privacy. We recommend adding side modesty panels if you want under-desk privacy and wire management on the sides of your desk. Side tables free up valuable desktop space and match your new desk. Keep printers, supplies, and decor close by but off your work surface. Fully assembled and ready to store! We recommend a filing cabinet that matches your new desk to help clear clutter and stay organized. All our frames come standard with an industry-leading 7-year warranty. Call, email, or chat - we're here to support you! See all those wires behind your current desk? Organize them with a wire management kit that will move up and down with your new desk! Our 1" thick 120 Degree Sit-Stand Workstation comes in white laminate, black laminate, bamboo. Made from recycled 45 lb particle board with a matching 3mm PVC edge, our GREENGUARD-certified laminate desktops are created and sealed without harsh chemicals or ingredients, so you don't have to worry about ruining your indoor air quality. We make our bamboo desktops with carbonized bamboo, which boasts beautifully saturated honey-caramel tones in the bamboo. They're sustainable for the environment and treated sans chemicals, eliminating chemical off-gassing in your area. The 120 Degree Desktop comes with two pre-cut grommet holes on the back of the desk. A Wire Grommet lets you route your cords and cables through a swiveling slot that opens and closes on your desk. Or upgrade to a Power Grommet, which adds a duo of power outlets to each grommet hole, giving you freedom to power and charge devices straight from your desktop. Want more grommets or a custom location? Give us a ring: 1-800-349-3839. The Half Circle Desk Drawer is the easy way to store small desk items and keep your desktop clear of excess clutter. This storage accessory has enough room for your writing utensils, paper clips, and sticky notes. Keep everything you need right at your fingertips. This useful storage solution integrates seamlessly into your UPLIFT Desk and swivels centrally, allowing you to access it from either side. Preserve the clean, open design of your desk with this handy accessory. The Small Half Circle Drawer is there for you when you need just a little more space to hide the extra knick-knacks cluttering up your desktop. This U-shaped drawer rotates 360° from underneath your desktop to give you quick access to notecards, pencils, or whatever else you want to stow away. UPLIFT Desk frames come in a variety of colors: black, gray, white, and now metallic (industrial style). A quick note about our metallic (industrial style) frames: Our metallic (industrial style) frame's finish is designed to have an industrial aesthetic, giving you an intentionally imperfect finish that shows off the character of the frame's raw steel legs and aluminum feet. That means that no frame will look exactly like another, which is ideal if you're searching for a desk that's as unique as you are. Looking for a uniform finish? We recommend our black, gray, or white frames, which are powder-coated for a more consistent look throughout the feet and frame components. Our sturdy desk frames are powder-coated to perfection and treated with a nontoxic finish, so you can breathe easy. Take a look at our legs. Where other standing desk makers offer 2-stage frames standard or "extended range" 3-stage desks for more money, we offer only the most affordable, reliable, fastest adjusting, and quietest height adjustable desk bases with our 3-stage frame. Our competitors offer less stable 2-stage frames that are slower to adjust - 33% slower to be exact. That's because our 3-stage frames feature three small spindles in each leg versus the standard two that come in 2-stage frames. 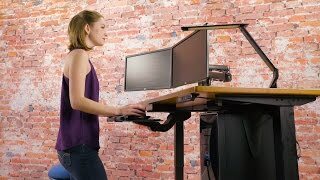 This allows you to raise and lower your desk faster, and provides you a much more enjoyable overall experience at your desk. This design also lets the frame adjust to higher and lower heights, so it fits a wider range of users, making it ideal for multi-user workspaces. If your goal is creating an optimally ergonomic workstation, you need to know this: 2-stage frames' reduced range of height adjustability means that at its lowest height setting the desk will not reach a spot that places your keyboard tray at an ergonomically correct height. The frame's upper height is also reduced, meaning taller users may not find these frames suitable for them. You also cannot add a treadmill to your work setup later on when using a 2-stage frame, meaning your desk will have fewer ergonomic options for adapting in the future. Our 3-stage frames boast powerful motors in each leg, which give you the stability you need to safely raise and lower your desktop. A lower weight capacity on 2-stage frames limits the amount of gear you can keep on your workstation. They are also more prone to overloading or breaking, which would put you, your desk, and your devices at risk of significant damage if loaded a few pounds over the already reduced weight limit. 3-stage frames come with a safety reverse sensing feature, so lowering your desk onto your things will not be an issue. But it would be on a 2-stage height adjustable frame, as it does not have this safety feature. Want a quiet desk? Single motor and 2-stage frames are typically louder when raising and lowering, whereas our 3-stage frames are whisper quiet by comparison. Invest in a desk that's there for you for throughout the highs and lows at work with UPLIFT Desk. Reclaim space on your desktop and type in ultimate comfort with the Large Keyboard Tray. Work with a surface large enough to accommodate a keyboard and mouse; this ambidextrous platform also comes with a removable wrist rest and mouse pad for more support for your wrists. And thanks to its sturdy mechanism that's easy to adjust, you can be sure you're always typing at the ideal angle for your posture and body. Flexibility is an important part of any ergonomic workspace. The Switch Keyboard Tray features an independent, ambidextrous, switchable mousing platform that complements a compact keyboard tray. This sturdy keyboard tray is easy to adjust to just the right level of tilt for you, putting you in total control of your comfort when working with a keyboard. Type with a keyboard tray that doesn't break the bank with the E3 Keyboard Tray. The spacious, curved surface provides more than enough room for both mouse and keyboard, letting you clear off your desk and type in better postures. We do recommend our Switch or Large keyboard trays over the E3 because both feature a larger tilt adjustment range, above-desk height adjustment, and an intuitive lift-and-lock height adjustment mechanism in contrast to the E3’s lever adjustment. Fighting for more space under your desk? The Track Spacer is a much-needed addition to your workstation, allowing you to mount accessories like keyboard trays and CPU holders, even on desks with existing crossbars. (Above and Below Desk) Above: 3"
When you need a little extra privacy or noise reduction, the Back Acoustic Privacy Panel will clamp on to desks ranging from 42" to 80" wide. The Acoustic Privacy Panel adds a pop of color as well as space to tack up memos or pictures. Choose from blue, dark gray, or light gray for the polyester covered board. Mounting the Acoustic Privacy Panel to your desk is as easy as clamping it into place. The mounting hardware is available in black, gray, or white to match the other components of your UPLIFT Desk. Clamp mounts are designed to fit desks up to 1.75" thick. Acoustic Privacy Panels are very easy to install using the clamp mounts. Slide the pegs of the two support brackets through the matching holes on the privacy panels, and attach on the other side to a duo of clamp brackets with a few flat-head screws. The completely assembled unit attaches to desks with adjustable clamp brackets; Simply twist them (note: righty tighty, lefty loosey) to tighten them securely to your desk. For a more flexible mounting solution, consider the Desktop Acoustic Privacy Panel Holder in black, white, or gray. Add a partition in a combined workspace or create a repositionable, sound dampening system for your office. Installation involves just one easy step – slide the Acoustic Privacy Panel into place in the designated slot. The holder also features a built-in storage compartment to help keep your desktop spick-and-span. The Modesty Panel with Wire Management combines privacy and organization, solving a common problem in open offices everywhere. The discreet black mesh design is perfect for providing protection and keeping your desk simple and stylish. It comes in four sizes; 42", 48", 60", and 72" wide to work with your UPLIFT Desktop. With the UPLIFT Desk Modesty Panel with Wire Management, you can have peace of mind without making a huge adjustment to your existing workspace. The mesh screen obscures the outside view while sitting, as well as offering a simple solution to clean up the look of wires and cables at and around your desk. This multifunctional accessory is the perfect addition to your UPLIFT Desk. A partial modesty panel, which is 42 inches wide, is a perfect addition to larger desks. This panel packs a punch by offering integrated wire management within the mesh pocket, while still partially concealing the view underneath your desk. If you would like to make your UPLIFT Desk mobile, you can outfit it at any time with our Desk Casters. Available in a set of four or five for every UPLIFT Desk model, these locking casters make your desk even more versatile. They work great on either hard floors or low pile carpeting. For safety and stability, the casters lock to keep the desk in place. For those who like to rearrange their spaces frequently or move a lot, casters make moving your desk a breeze. Please note: Casters will add approximately 2" of height to your desk. Nothing will get in the way of your UPLIFT Desk when you add Heavy Duty Locking Casters. Your UPLIFT Desk will glide over uneven surfaces, cables, and even debris with these wheels in place. Their durable construction will put your mind at ease as you push your standing desk to a new home across the warehouse. Each caster is 4 inches in diameter and boasts a 265-pound weight capacity. And when mobility isn't necessary, just lock each caster in place with a foot-activated locking mechanism. Please note: Heavy Duty Casters will add approximately 5" of height to your desk. Featuring all of the adjustments you'd expect to find in a high-end office chair at a price you'll love, the Pursuit Ergonomic Chair comes packed with options: seat tilt tension control, adjustable lumbar support, height and swivel adjustable arms, backrest angle adjustment, an adjustable headrest, and white and black color options. Feel the cool air circulating through the mesh back as you sit on the contoured leather seat of the J3 Ergonomic Chair. Think of it as business in the seat and party in the backrest. But the fun doesn't stop there, the J3 Ergonomic Chair offers an adjustable headrest, armrests, seat depth, and seat height. Exceptional lumbar support and an all-around great design make this a good chair for most body types. The Vert Ergonomic Office Chair Back up to the Vert Ergonomic Office Chair and feel what it's like to have seating that conforms to your body in all the right ways. The chair's back was designed to mimic the human vertebrae, ensuring you have steadfast support along the entire spine and lumbar region. Change the way you think about seating. The Ergonomic Kneeling Chair alleviates lower back pain, improves circulation, and boosts energy by encouraging you to sit in the proper posture while strengthening oft-forgotten muscles. This revolutionary chair also helps to properly align your back, shoulders, and neck, for comfortable and invigorating seating you'll have to experience to believe. It's your choice of Gray or Blue color options on the seat and knee cushions, to match your new chair with your space. When you need a break from standing, try perching on the E7 Stool. This mobile stool allows you to tilt, pivot, and rotate 360 degrees. Top that off with a padded seat cushion made from breathable and stain-resistant fabric plus a built-in handle for portability, and you've got a winning combination. Take flight with this light, flexible active seating option. The Starling Stool features a modest 10 degrees of tilting and 360 degrees of rotation with a base that remains flat on the floor. The handle tucked behind the seat makes this lightweight stool easy to pick up and move between your desk and anywhere else you need to work throughout the day. Choose from five available colors: Myrtle Green, Blue, Orange, Gray, or Brown. The Motion Stool gives you the option to sit, lean, or perch. It supports you through a wide range of movements, keeps you stable, engages your core, and promotes activity. Perching, or "perch-sitting", provides an optimal hip angle, encouraging comfort and healthy posture. Recommended for users 5'2" and taller; more petite users can add a footrest for a better fit. Our E3 Crescent Saddle Stool lets you comfortably perch atop its elongated, 360 degree swivel seat, which also conveniently rotates into two different orientations. This design gives you the choice to sit in traditional or straddled postures, whatever your mood calls for. Pick from turquoise, green, or orange upholstered seats on your E3. Our E3 Donut Stool is a perfect complement to your seated set-up. Get up more and take a spin on the 360 degree seat. Our soft cushion is rounded and has a center dip, like a donut, to reduce pressure on your back and legs as you sit. The stool pivots from underneath the seat, encouraging free rocking and leaning in every direction while the base stays flat on the floor. Engage your legs and your core and find more energy at work. The E3 Donut Stool comes standard with a black base and two fabric options: red and gray. The award-winning Steelcase Amia Chair provides unsurpassed functionality for users of all sizes. The Amia chair is offered here with standard black fabric, a black frame, and some of the most adjustable armrests on the market. You can rest assured that you will love your Amia Chair or get your money back with Steelcase's 30-day satisfaction guarantee. The Steelcase Think Chair provides exceptional ergonomic adjustability wrapped in a modern package. Steelcase's LiveBack support system adjusts to your body as you move throughout the day. The Think Chair is available here with standard black fabric, a black frame, and adjustable armrests, and is backed by Steelcase's 30-day satisfaction guarantee. The Steelcase Leap Chair also features Steelcase's LiveBack technology, which supports your back as you move. The seat on the Leap Chair will glide forward as you recline your chair, a handy feature if you enjoy working in a reclined position. As with the other Steelcase chairs, the Leap Chair is available here with standard black fabric, a black frame, and adjustable armrests, and is backed by Steelcase's 30-day satisfaction guarantee. The Steelcase Gesture Chair was designed for users who frequently use gadgets such as tablets, smartphones or laptops, which aren't always conducive to the best posture. Featuring Steelcase's LiveBack technology and arms with 360° swivel arms, the Gesture Chair is highly adjustable. The Gesture Chair is available here with standard black fabric, a black frame, and adjustable armrests, and is backed by Steelcase's 30-day satisfaction guarantee. The CPU Holder allows your CPU to travel up and down with your height adjustable desk as you go between sitting and standing throughout the day, and it also frees up valuable desk space and leg space, making it an excellent addition to your desk. The under-desk track and swivel mechanism allows easy access to ports. Most modern computer towers will fit in the ample accommodation provided by this CPU holder, which makes an ideal addition to any UPLIFT desk. Please note: Mounting options are limited when pairing this with a 48" wide desktop. Please refer to our blog article, which shows the possible configurations. If you still have questions, please give us a call and we would be happy to discuss it with you! Protect your CPU from spills, dust, and overheating by storing it off the floor with the E3 CPU Holder, which comes in black, gray, or white. This economical computer tower holder will keep your CPU running efficiently, away from the hazards lurking on the floor. Attaching your CPU to your sit-stand desk also prevents the connection cords from being yanked when you lift your desk up. The E3 CPU Holder is a great investment to protect your CPU while remaining in your budget. Take a look at the comparison chart below to help you decide which CPU Holder is right for you! Our Standing Desk Mat, measuring in at 18" deep by 30" wide, provides supportive comfort for standing at your UPLIFT Desk. It has a textured surface to prevent slipping, and its gel foam core offers the perfect combination of cushioning and resistance to keep you standing comfortably and healthfully. This lightweight yet durable mat is easy to clean and store, and maximizes the ergonomic benefits of a sit/stand solution. The E7 Active Anti-Fatigue Mat offers a way to stretch, exercise, and get some extra support while standing. Massage your feet on the textured mounds located on the front or back of the mat. Stretch the arches of your feet or your sore calves by moving into different positions on the mat. Stand up and feel the support of the anti-fatigue surface, coupled with a multitude of different ways to interact with this active mat. Discover a whole new way to stretch and exercise while at work with the E7 Active Anti-Fatigue Mat. Work with the right combination of activity and support; the E7 Small Active Anti-Fatigue Mat boasts a rest bar and massage mounds to rest, massage, and stretch your muscles and feet. Lastly, a high-density core takes a little weight off your lower extremities, letting you stand for longer (and more comfortably) than ever before. If you're looking for a way to get reminders of when to stand throughout the day, and to control your UPLIFT Desk conveniently from your phone, the UPLIFT Desk Connect Dongle and UPLIFT Desk Connect app allow you to do that (and so much more). The E3 Adjustable Footrest provides a resting spot for the often-forgotten feet. No assembly is required, simply open the box, place the adjustable footrest underneath your workspace, and you will be sitting back in comfort in no time. The grooved rubber top surface ensures that your shoes won't slip. Two legs provide four different angles of adjustment: 6, 12, 16, and 25 degrees. If you are a petite person and use a standard-height chair or stool, we recommend adding an adjustable footrest to your workstation. An adjustable footrest will help you keep your feet planted on a solid surface. The Standard Keypad allows basic up/down functionality for your frame. Simply press and hold to raise or lower the top. The 1-touch Advanced Digital Memory Keypad displays the height of the top above the ground in inches, and can store four different heights in its memory. Programming the keypad is simple. When the top is at the desired height, press the M button, then a number to assign the current position to that number. It's as easy as that. If you want total control over your lighting, look no further. The E3 LED Desk Lamp is a powerful little light that provides five different levels of brightness and the ability to fine-tune your color temperature from warm to cool, matching with your current mood and the light conditions in your room. The E3 is controlled by touchpads on the unit's base, and features an aluminum lamp head that opens up to 170 degrees, and a built-in USB charging port on the base. Available in black, gray, and white to match your UPLIFT Desk. Light up your desk with the Illuminate LED Task Light. The head rotates and swivels to direct five levels of brightness and three color temperatures exactly where you need a little extra light. The features don't stop there, a USB port in the base lets you charge your mobile devices from your desktop. And the soft blue nightlight in the base automatically turns on to provide gentle, ambient lighting when the task light is not in use. Light up your life, or at least your office, with the E7 Desk Lamp with Clamp. This desk light clamps onto the edge of your desk, or through a grommet hole, to bring ambient lighting to your desktop. The desk lamp is available in black, white, and blue to match a multitude of UPLIFT desk accessories. Another great thing about the E7 Desk Lamp with Clamp is its ability to transform from a clamp-mount into a regular desk lamp or floor lamp with the addition of the optional desk base or floor base. Simply remove the clamp mount and insert the lamp into the new base. Watch this transformational lamp take on a new form in front of your eyes while the light transcends to reduce eye strain felt from staring at a computer screen all day. The Single Monitor Arm system lets you to clamp your monitor to the back of your desk or through a grommet hole with no additional drilling required. The single arm is capable of handling one monitor, or one laptop, and is VESA-compatible. Check your monitor's model for VESA compatibility before purchase. Two monitors improve productivity and are quickly becoming the standard in offices. The Dual Monitor Arm provides fingertip adjustment for two monitors or a monitor and a mounted laptop. As with the single arm, the dual arm uses the VESA standard. Check your monitor's model for VESA compatibility before purchase. Use your laptop's display with a secondary screen with the Laptop Mount. Once properly counterbalanced for your notebook computer, enjoy fingertip adjustability on either a single or dual arm system. The Zilker Single Monitor Arm lets you to clamp your monitor to the back of your desk or through a grommet ranging from 0.4" - 3.15" in diameter with no extra drilling required. The single arm is capable of handling one monitor, or one laptop, and is VESA-compatible (75 mm and 100 mm). Two monitors improve productivity and are quickly becoming the standard in offices. Our Zilker Dual Monitor Arm provides fingertip adjustment for two screens or a monitor and a mounted laptop. As with the Zilker Single Monitor Arm, the dual arm uses the VESA standard (75 mm and 100 mm). Get your screens to better ergonomic positioning with UPLIFT View Monitor Arms. With single and dual models available, you'll have freedom to adjust and pose in your favorite positions in seconds. The UPLIFT View system is VESA-compatible. Check your monitor's model for VESA compatibility before purchase. Don't forget about your laptop when outfitting your ergonomic workstation. The View Laptop Mount allows you to attach your notebook computer onto any UPLIFT View Monitor Arm and move it in the most comfortable positions. Take your activity level up a notch by placing the E7 Motion Board underneath your new standing desk or table. The E7 Motion Board features faux leather padding to provide support as you rock or tilt while working. The soft faux leather support reduces the fatigue felt from standing. The bottom surface of the board is curved to promote an easy rocking movement while you stand at your workspace. Engage your core muscles, recruit your legs, and have more fun at work with the E7 Motion Board. Please note: The E7 Motion Board should not be used when wearing heels or unstable shoes. We combined the beauty of genuine bamboo and ergonomic movement with our Bamboo Motion-X Board. When you're ready to rock, tilt, and move more at your desk, this board provides for a more engaging and active standing experience than simply standing in place can offer. Stand with support. Adding a Comfort Mat to your board gives you a layer of anti-fatigue protection and allows you to use it for longer periods of time. Please note: Due to the tilting motion users get to experience when using this accessory, we don't recommend using the Bamboo Motion-X Board with unstable shoes or shoes with heels. The Fit Motion Board is designed to offer you anti-fatigue support and a level of activity that can adapt to your needs. The padding on the Fit's surface helps make standing easy, using the same technology found in most ergonomic desk mats, and has friction to protect against slipping. You'll find yourself tilting and rocking in comfort for longer. The nifty heel grab makes it easy to pull this out from under the desk, and optional bumpers may be installed on the underside to adjust the amount of tilt you experience when using the board. Please note: We do not recommend using the Fit Motion Board with heels or other unstable shoes. Our Standing Mat in 18" x 30" provides supportive comfort for standing at your UPLIFT Desk. It has an anti-slip textured surface, and its gel foam core offers the perfect combination of cushioning and resistance to keep you standing comfortably and healthfully. Stand up and get moving with the E7 Active Anti-Fatigue Mat. This mat supports your legs and knees while standing thanks to the cushioned polyurethane foam. Stretch, massage, and activate your muscles on the multiple support surfaces built into the active standing mat. You get the E7 Active Anti-Fatigue Mat at a deeper discount when combined with the promotional Desk Organizer Set, than when purchased solo as an add-on option. Organize your desk with our zen-inspiring, eco-friendly 8-Piece Bamboo Desk Organizer Set. You'll get large, medium, and small bamboo boxes to keep your desktop clean and looking great. Write with a smooth and consistent line with our genuine bamboo ballpoint pen with blue ink. You'll also enjoy a matching 4" x 6" picture frame, business card holder, phone holder, and pen holder. Keep yourself organized, bamboo style. Organization never looked so colorful with the Desk Organizer Set, available in matte finishes that fit the rainbow - aqua, blush, blue, and white. Clean up clutter with a large paper tray, medium box, small divided box, pen holder, business card holder, and six gray pens with blue ink. Finally find a home for loose ends that will also add brightness to your day. Extend your computer's USB capability with this 4-port hub. These USB 3.0 ports are suitable for data transfer and charging, perfect for any USB-compatible devices you have. Tilt, rock, and balance your way to more movement throughout the day with the Bamboo Motion-X Board. This beautiful board is made from environmentally friendly bamboo and helps you vary your posture and increase circulation. Include a Comfort Mat for additional anti-fatigue support for your Bamboo Motion-X Board. For just a little extra, your free Bamboo Motion-X Board can have amplified standing support via this low-profile, yet high-density standing mat. Organization never looked so colorful with the Desk Organizer Set, available in matte finishes that fit the rainbow - aqua, blush, blue, gray, and white. Clean up clutter with a large paper tray, medium box, small divided box, pen holder, business card holder, and six gray pens with blue ink. Finally find a home for loose ends that will also add brightness to your day. Give yourself ample space for all of your small things with the Small Half Circle Desk Drawer. It's perfectly sized to store your glasses and memos, allowing you to keep a clean look at your workspace. Our tablet stand is the ideal solution for notebook and tablet users looking to adjust the viewing angle and height of their screen. The stand features seven support angle positions, and its lightweight-yet-sturdy construction makes it perfect for travel. Got accessories lying around? Hang 'em! Add a pair of hooks for bags or headphones to stow your thing neatly beneath your desk. The Under-Desk Hooks also work well for routing those unruly wires underneath your desk. If you are looking to make your desk into a private cove, add Side Acoustic Privacy Panels. The noise reducing panels are great for open concept offices. Create a uniform look by adding the same color side panels to your UPLIFT Desk. Or kick your office up a notch with contrasting side panels. Add more functionality and privacy to your desk with the Side Modesty Panel with Wire Management. The 29-inch panel can be attached to one or both sides of your desk. It features a mesh pocket to conveniently house your power cords while also providing discreet privacy. Keep power within easy reach on your desk as it travels with you throughout the day with our desk-ready power solutions. With units that install directly to your desk and prevent cords from snagging, you can rest easy knowing that you'll be able to charge and power devices without worry of cables pulling from wall outlets. Enjoy having power and surge protection combined with our Clamp-on Surge Protector with USB Charger. Or if you want to add two power and two USB ports to your desk's edge, do it with our Clamp-on Power with USB. Both options provide convenient power with sleek designs that attach to your workstation (and can also be paired with all of our wire management options). Slide on over to the 2-Leg Side Table when you need the extra desktop real estate. The Side Table provides space for a printer, books, or any other essentials you need accessible, but not while standing up. The 2-Leg Side Table is available in a matching desktop style and frame color as your UPLIFT Desk. All you need to do is choose what size desktop fits best in your office. The fixed, 2-leg frame of the side table provides a sturdy base for this stationary accent table. While the matching desktop provides a cohesive, complete look. No more stealing your coworker's chair when you need to collaborate. Instead, roll up your 2-Drawer File Cabinet with Seat, Rolling and enjoy the functionality of a multi-tasking piece of furniture. This file cabinet comes in black, gray, white, and metallic (industrial style). A storage tray can be added to the top drawer for more organization. Plus, hang legal or letter-sized files in the bottom drawer. Lock up the cabinet when you need to keep your top secret documents... or cookies away from prying co-workers. Want a clean desk but don't have enough storage space for all your desktop clutter? Add the 3-Drawer File Cabinet to your E7 Electric Standing Desk Converter and marvel at the additional storage you have on your hands. The top drawer of the file cabinet locks to securely stow valuables, while the bottom drawer holds letter and legal sized paper. Casters let you roll and store your file cabinet wherever it is needed. Order your storage system in black, gray, or white. When space is limited underneath your desk, get more bang for your buck with the Narrow 2-Drawer File Cabinet with Seat, Rolling. This cabinet combines storage and seating in an attractive slim cabinet that won't impede on your leg room. Available in black, white, and gray powder-coated finishes to match the UPLIFT Desk frame and other desk accessories. Finally find a home for the small to medium-sized items cluttering up your desktop, including letter and legal-sized files, with two drawers that lock for security. A cushion provides extra comfort when using the cabinet as a seat or footrest. And, stability when seated is not a problem with four locking casters and a fifth caster for support. The Slide Out Office Storage Cabinet will add more organization to your workspace. This cabinet features a large door panel that slides out to expose two more left or right facing storage compartments. The direction the compartments face cannot be changed, so be sure to choose the direction that best works with the placement of the storage cabinet in your office space. Available in both black and white to match the UPLIFT Desk line, the Slide Out Office Storage Cabinet keeps organization classy. Another great feature is the rear situated grommet hole that allows you to route a power cable or other cords. Store and charge your laptop at the same time! Pedal to your unique rhythm at your sit-stand desk and enjoy a more productive workday with the E3 Under Desk Exercise Bike. It fits underneath our height adjustable desks perfectly, allowing you to boost your energy levels while you work. If your goal is to move more in the office, having an ergonomic accessory, such as an under-desk bike, can do just the trick, giving you more options for movement. Gently pedal your way to more creativity during your brainstorming and collaborating sessions with coworkers, or turn up the tension for more of a burn while you take your calls and finish up your spreadsheets. For those who get bored with standing or walking at your desk, take the LifeSpan Solo Under Desk Bike for a spin. This under desk bike is powered by you, leaving it free of cords that would get in the way. Four casters offer portability, making it easy to move the bike under your desk when not in use. The oversized pedals, waterfall seat cushion, and small back support provide ample comfort when you want to go the distance. Leave your road bike at home and pedal your way to a healthier you with the LifeSpan Solo Under Desk Bike. The act of slowly pedaling forward or backward at your desk can increase the blood flow in your legs without forcing you to break a sweat or break your concentration on the task at hand. Energize yourself and burn calories while working with a standing desk treadmill. Lifespan is the leader in walking workplace treadmills, and we're proud to offer them with our UPLIFT Desks. Available in three different models - TR800-DT3, TR1200-DT3, or TR5000-DT3 - Lifespan makes a treadmill that will work in any office environment. Features include a large walking surface, a whisper-quiet motor, Intelli-Guard technology to automatically stop the belt when you step off, and a console that tracks distance, calories burned, time spent walking, and steps taken. This product can expose you to chemicals such as Cadmium and Vinyl Chloride that are known to the state of California to cause cancer and birth defects or other reproductive harm. For more information go to www.P65Warnings.ca.gov/product. We stand behind the quality of our products and their high level of craftsmanship. That's why we're proud to offer a market-leading 7-year warranty standard on all our frames. We're also known for our steadfast support and unmatched customer service. That's why we offer a 12-year extended warranty, which covers the frame and its component parts, for a small charge. It's all the service and support our customers have come to expect, just that you get five more years of it. Restore order underneath your top with the help of the Basic Wire Management Kit. Tidy, bundle, and attach your cords to the underside of your UPLIFT Desk so that they are free and clear from your frame mechanism as you move from seated to standing. Enjoy a workspace that's clutter-free and organized to your liking with a little help from our Advanced Wire Management Kit. Please note that your desk comes with a slightly smaller wire management tray, which you can use in combination with this kit. You don't have to struggle with less-than-ideal organization at your workstation. The Ultimate Wire Management Kit includes all the components of the Basic Wire Management Kit, plus a 29-inch modesty panel to route your cords. Get your cords off the floor and out of the way with the Ultimate Wire Management Kit. The Magnetic Cable Organizing Channel fits right in with the UPLIFT Frame to provide a sleek cable organization solution. The channel is constructed from steel and powder-coated in the same great colors as the UPLIFT frame - black, gray, white, and metallic (industrial style). At 14.5'' L by 2'' W by 1'' D, this channel provides ample space for wires, cords, cables, and any other loose lines that need to be channeled in a new direction below your top. Installation doesn't get any easier with the Magnetic Cable Organizing Channel. Place the channel anywhere magnetic on your frame, such as the crossbar or legs, and route cords through the channel's open slot. Stop worrying about loose cables getting pulled out when you adjust the height of your frame and channel your energy elsewhere, with the Magnetic Cable Organizing Channel. To meet unforeseen high demand, we are manufacturing a limited, expedited batch of our 3rd legs at a higher cost. This means we can ship your order in mid-February instead of waiting for our normal production batch to be ready to ship in early March. However, if you don't mind waiting until early March for your order to ship, we'll pass along our $50 of production savings to you! Just select Normal Lead Time to save $50, and your desk will ship a few weeks later. Get creative with your open office layouts! In an era of thinking outside the box, isn't it time you started thinking that way about your office layout and desks, too? We took traditional desk designs and modified them to suit the changing office. Whether you're building a solo ergonomic workstation or designing an entirely new flexible office layout with varying desk styles and configurations to maximize your space, the 120 Degree Sit-Stand Workstation can work for you. Pair with our acoustic privacy panels to lower the volume and give your team members a bit of privacy. If the 120 Degree Sit-Stand Workstation isn't right for you, click here to shop our growing collection of four-corner standing desks. Our desks are better because of our industry-leading three-stage frame, which features an expanded height adjustment range over competitors' desks. This allows you to task at the perfect height for your body. A dual-motor design makes it quieter to adjust, safer, stronger, and more reliable than single-motor designs on the market. Many height adjustable desks have only a two-stage frame, which means they're limited in their height adjustability. But the UPLIFT Desk frame lifts higher and descends lower, which means it'll work more comfortably for more people, even multi-user workspaces. Our three-stage frame is also 33% quicker to adjust thanks to using three spindles instead of just two, leaving two-stage frames in the dust. With UPLIFT power grommets at your desktop, you can power devices where you need them with a handy in-desk power source. Designed and made to integrate seamlessly into your new standing workstation, you can be sure you're all charged up for when you're away from your desk. The UPLIFT Advanced Keypad not only displays the current height of your fully height adjustable workstation, but also is capable of storing up to four user-defined height preferences within its memory, making it the perfect desk keypad for shared workstations. Warranty 7 year all-inclusive warranty on entire desk frame: motor frame, controller, keypad, electronics and mechanisms included. Extension to 12 years available. Will this desk work for me if I need a standing desk workstation for my double monitor desk? You bet! Our 120 Degree Sit-Stand Workstation was designed to deliver you an ergonomic (and comfortable) working experience, no matter how many monitors. Thanks to a center cutout on the desk, you're able to task in an ergonomically-correct posture, closer to your work area and your monitors. This desk is suitable for multiple monitor users, as well. The desk comes with two pre-cut grommet holes in the center near the back of the desk, so you can mount a single monitor that way. Or, save those grommets to use for power or wire grommets, and mount your double monitors on each side of the workstation. Build the workstation you need now with this revolutionary sit-stand desk. What is the 120 Degree Sit-Stand Workstation’s weight capacity? The 120 Degree Desk boasts a 355 pound lifting capacity, but if you need a desk that has a heavier weight capacity, check out our selection of 3-leg and 4-leg desks. Is this workstation laminate? Isn’t that a little dated? Yes, but this is no ordinary laminate table. We make only the most stylish, durable, and eco-friendly laminate desktops you can buy, so you can rest easy knowing you’re getting a desk that will be with you through years of work and one you'll be proud to claim as yours. Are there any color options for the frame? Yes, we offer this desk frame in four colors - white, black, gray, and metallic. Can I order grommets on the workstation? The 120 Degree Sit-Stand Workstation by UPLIFT Desk comes with two pre-installed grommet holes on the back of the desk. This gives you a spot to install bolt-through monitor arms at an ergonomically-ideal viewing spot. Or if you'd rather, choose a wire or power grommet and we'll make sure it happens! Is this desk suitable for gaming? Absolutely! The height adjustment of our 120 Degree Sit-Stand Workstation is great for gaming, sewing, crafting, you name it! You’ll have the option to stand and stretch your legs and increase circulation throughout the body, which can improve your end score in the game and increase energy for creative projects. Will I need more than one person to put my desk together? You should be able to assemble the desk frame and attach it to the desktop solo. But we do recommend you use two people to safely turn the desk right-side up after assembly. Check out our assembly video to see just how easy it is to put your desk together. Can I use the desk accessories I already own on the 120 Degree Workstation? If you already own a keyboard tray, monitor arm, or CPU holder, keep them to add to your new desk! Just double-check the manufacturer's instructions to make sure that your accessory is compatible with the thickness of the desktop. Keep in mind that the crossbar on the UPLIFT desk will run across the center of the desk and may get in the way of a keyboard tray or CPU holder. Our track spacer solves this problem by allowing your keyboard tray or CPU holder to retract underneath the desk without interfering with the crossbar. I live outside of the United States, will this desk work with my voltage and outlets? Yes, all UPLIFT Desks are designed to run on the US electricity standard of 120V, so if you're ordering from outside the United States, excluding Canada, you'll need to plug your desk into a step down transformer, otherwise you could overload your desk's control box, which is not covered by our warranty. Please contact our team if you have any questions regarding your country's voltage. Which version control box is on my desk? It's easy to check to see which control box you have, just take a peek at the silver label on it. If that sticker says v4.1, v4.2, or v4.3, you have the newest version of UPLIFT Desk's control box, which comes with new features! What features can I expect on the version 4 control boxes? We added some exciting new features to our version 4 control boxes, starting with Collision Sensitivity. This feature lets users set the sensitivity for their desks to one of three settings, so when adjusting, the desk stops when it touches an object, instead causing accidents by continuing to raise or lower. Keypad Lockout is another exciting new safety feature. Easily keep kids and unwanted hands from adjusting the 120 degree workstation when this feature is activated. Users will also be able to toggle quickly between One-Touch and Constant-Touch modes with just a few buttons, in addition to being able to switch between inches and centimeters on the keypad. Does this desk come with a three-stage frame? Yes, all UPLIFT Desk frames are three-stage vs the traditional two-stage desks on the market today, which means our desks are 33% faster to adjust thanks to using 3 spindles in each leg instead of 2. This means you have a higher range of adjustability so desks fit shorter users and kids, all the way up to very tall users or those who plan on adding a treadmill to their setups later. All UPLIFT Desks feature a dual-motor design so each leg gets its own motor, making UPLIFT Desks quieter to adjust, stronger and more reliable, and safer than desks with a single motor. This means you can rest assured that your UPLIFT Desk is the most technologically advanced height adjustable desk you can buy today. Does the workstation always have to be plugged in, or can I unplug it? The UPLIFT desk frame should remain plugged in at all times. Its low-draw power supply will reduce electricity consumption. This product comes standard with a 7-year limited warranty. For more information on UPLIFT warranty coverage, click here.